Beaten-down producers Penn West Petroleum, Baytex Energy, and Pengrowth Energy could rise from the ashes as crude heads higher. Crude's dive into the $20s earlier this year exposed a big problem for a trio of Canadian oil producers. At less than $50 a barrel, Penn West Petroleum (NYSE:PWE), Baytex Energy (NYSE:BTE), and Pengrowth Energy (NYSE:PGH) do not make enough money to sustain their operations. So with crude slumping well below that level, each company was forced to turn off wells, suspend dividends, and cut capital expenditures just to try to stay afloat. Because of the cuts, investors worried that these companies would not survive the downturn, which weighed heavily on their stock prices. PWE, BTE, PGH data by YCharts. 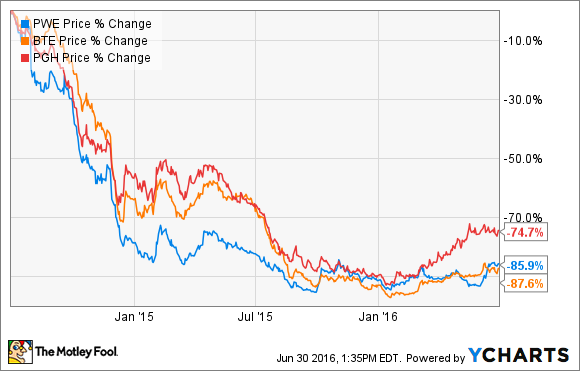 However, with oil prices improving all three companies are starting to find their footing. Further, if oil keeps rallying, these oil stocks could rocket higher due to their ability to deliver robust growth in an improving oil market. With crude seeming to fall into a bottomless pit earlier this year, producers were forced to take drastic action. For Baytex Energy, this included turning off wells that had ultralow or negative margins. During the first quarter, the company shut in 7,500 barrels per day of its heavy oil production, which equaled about 9% of its output. Penn West Petroleum and Pengrowth Energy, likewise, shut in uneconomic production during the quarter, though not nearly as much as Baytex. In addition to shutting down unprofitable wells, all three companies have worked this year to improve their stressed balance sheets. Penn West Petroleum, for example, sold $1.3 billion of assets, enabling the company to stave off a looming default under one of its debt covenants. Pengrowth Energy did not go quite that far, instead paying back $173 million in debt with cash flow from operations. Baytex Energy, on the other hand, collaborated with its banks to get some covenant relief, to provide it a bit more breathing room. These moves enabled all three companies to stay afloat even as oil prices were sinking. Because of that, all three companies are in a position to rise out of the ashes now that oil prices are improving. Baytex Energy has already started to capture the upside to higher oil prices by turning most of its previously shut-in wells back online. The cash flow from those wells, along with higher cash flow from the rest of its legacy production, should boost the company's cash flow above its expectations. That provides the company with capital that could be used to restart its production growth engine. Furthermore, with oil back in the mid-$40s, all of the company's three development areas are once again economic and can deliver even more attractive returns as oil heads higher. Penn West Petroleum, likewise, is now in a position to restart its oil growth engine. Given its current portfolio and drilling economics, the company anticipates that it can grow production by 10% per year at current prices. Production growth, meanwhile, could accelerate to a 15% compound annual growth if oil rises to $60 a barrel. Pengrowth also has the potential to thrive as oil prices rise. The company estimates that it has the potential to invest C$6.6 billion into its Lindbergh thermal oil position to drive future production growth. It has a further C$4.7 billion investment opportunity to grow production out of its Montney gas assets. Crashing oil prices almost destroyed these Canadian oil producers. However, by taking drastic actions, all three companies survived the downturn, and are now poised to thrive as conditions improve. All these companies need is for oil to move a bit higher so they can restart their growth engines, which could be the catalyst to send their stock prices rocketing higher.